These are not necessarily connected, but reflect my divergent states of mind. We have been in Prague for (my husband’s) conference and were royally entertained. The food was actually ‘awesome’, both the meals and the continuous supply of irresistible nibbles, and even works of art. For the past thirty plus years I have airily dismissed the ‘slug’ problem. Others had slugs; I rarely saw one. All change. They have eaten all the tulip leaves and shredded and decapitated many of the irises, they have munched the lilies to oblivion before I could see them. 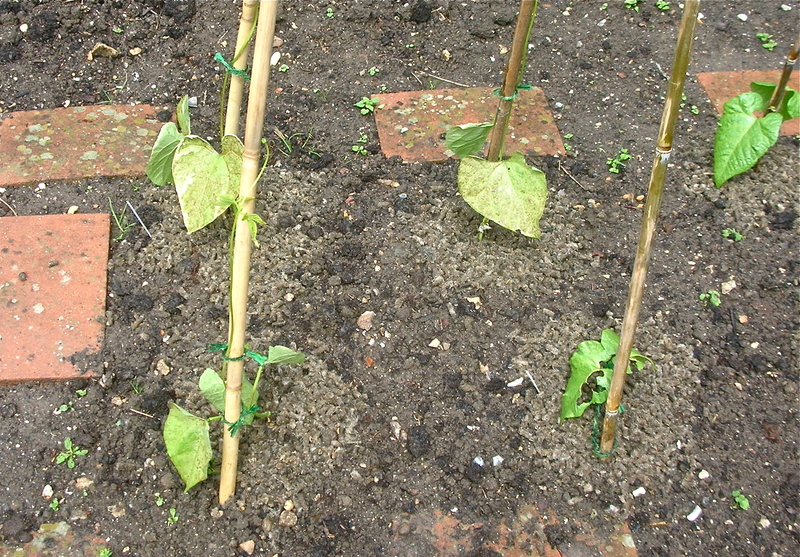 They have demolished my precious seedlings – the first from the greenhouse that I planted out two weeks ago. So, I now collect handfuls of slugs every time I leave the house and heave them into the green bin – a variation on squishing blackly and lily beetles. I have purchased a copper collar for my chocolate cosmos and the latest organic control – wool pellets for the veg plot. These are not beautiful and smell somewhat of goat, but I am hoping to save the runner beans. For the last three years I have been looking for a non-fiction publisher for my manuscript Writing to a Ghost: Letters to the River Kwai 1941 to 1945. One of my 2013 emails has just been answered! Am still looking? Indeed I am, and they sound fine … in their field (mostly sport). I never thought I would be able to resist an invitation to submit to a publisher, but sadly I feel that my book will not fit with their other titles (and I suspect their team will not have design and editorial expertise in titles about WWII and women’s roles) and they definitely do not have appropriate trade supply connections. Am I mad? Beer works! Thanks to everyone who suggested it. This entry was posted in Gardens, Writing notes and tagged copper slug collar, food art, guelder rose, hail, melon art, non-fiction publisher, organic slug control, Prague, slugs, Tree peony (white), wool slug pellets by hilarycustancegreen. Bookmark the permalink. We used to deal with slugs by placing a few jar lids filled with beer around the garden bed. They love beer, crawl into the lid and never crawl out. I don’t know if they got fatally drunk or drowned, but we discarded the corpses regularly and refilled the lids until the problem went away. Jar lids sound simple, I thought I had to bury yogurt pots. This is on my armoury list, I just haven’t got to it yet, also half oranges, under which they collect. I will put temptation their way immediately, thanks. I have heard of Cynthia’s remedy. Worth a try. As for the publisher I can’t help wondering about the very long delay in replying to your email: it doesn’t seem any too businesslike. And if they aren’t businesslike in that . . .
You may be right, but my respectably published friend, who writes non-fiction, also gets these year plus delayed responses. I think a couple of years is nothing to the mainstream publishing. Slugs and snails love oyster plants and we have many of those outside the garage as a decoy to prevent them from grazing the front and back garden. We, or rather Milo, has won the battle with the possums and he now has moved to our neighbours gardens trying to prevent posums from eating their plants. Of course ducks love snails and slugs too. I suppose the beer is the best. At least they die with a smile. Yes, decoy plants may be another good method, though we are talking of thousands of slugs and if you feed them they grow and breed… I think I prefer the hedgehog to ducks, they leave less mess. Milo has it easy, I imagine possums are noisier and bigger than (most) slugs. 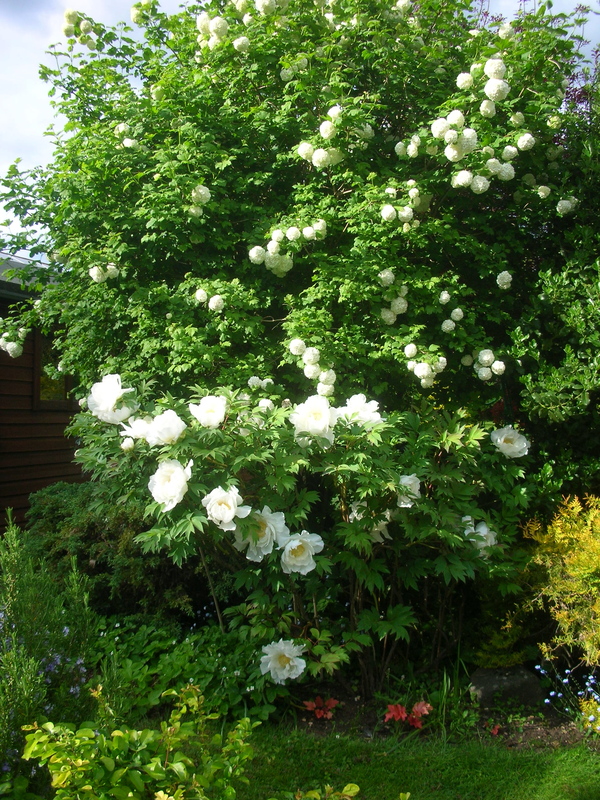 Enjoyed seeing your different photos Hilary, especially your tree peony and gilder rose tree. Those carvings on fruit are amazingly done! It is so disappointing to have slugs. I have never heard of the wool pellets, I hope they work. Good luck finding a publisher! Thanks, the fruit carvings were truly astonishing. The answer to slugs and publishers may be to concentrate on one subject at a time instead of dashing about. I’ll report back about the wool pellets. Cynthia is right. I use flat trays of beer all over the vegetable garden when I am concerned about snails and slugs. Unlike commercial pesticides it’s cheap and dogs and cats and birds won’t get sick from it. 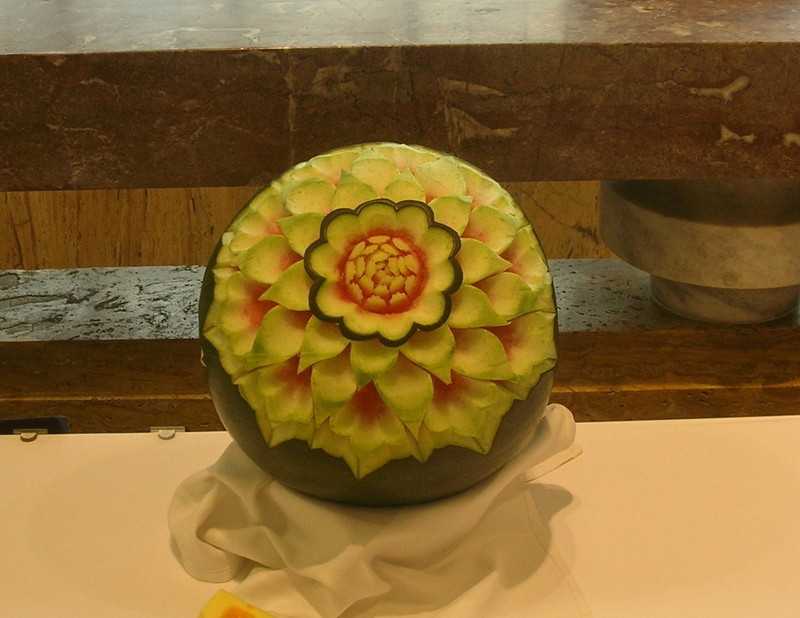 But the watermelon carvings are a real thing of beauty. The first beer traps are out there. Don’t worry, I am only using safe methods (mostly gather and drop into green bin). Someday you will find the right publisher. Writing is the easy part. Finding the right publisher is the hardest part. I know, and if I haven’t made progress by Christmas I will self-publish next year. Everything in the garden looks great. Could I eat a work of art? Probably. Thanks. 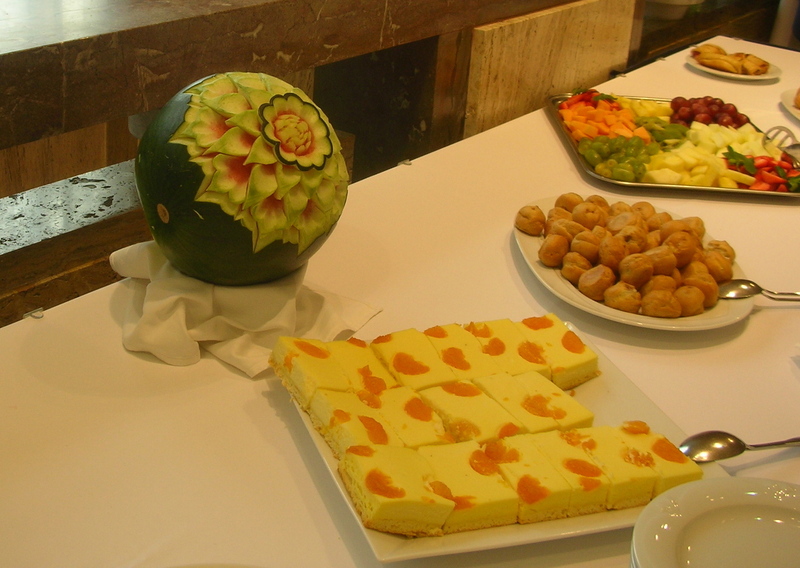 I didn’t dare deface the melons, besides there were so many other delicious things on offer. Who or what are the natural predators of slugs? I’m sure there are many in our garden but I see very few. I see lots of Song Thrushes and Blackbirds though. Maybe they perform the clear up for us. Our rhododendrons are in full blossom and looking amazing. SOme of the azaleas are already over and the last of the bluebells are keeling over until next year but other plants are springing up. The cycle goes on. Thrushes – there used to be plenty 30 plus years ago, but they have vanished from our garden, and hedgehogs. We appear to have just the one, there were two last year. Some of the slugs are look big for a blackbird. On SpringWatch last year they showed owls feeding their young on slugs – very messy. So exciting to be seeing your garden through its first annual cycle. Hope there are lots of happy surprises. Your relationship with your publisher is like a marriage, Hilary, and nobody wants an unhappy marriage! For what it’s worth, I think you’re not mad at all. You are right. I have now seen an example of one of their titles and am underwhelmed. I have sent a polite negative. Leave beer in shallow tins out near your plants. They will die a happy, drunken death. I have, and it works, thanks. The fruit carvings are impressive and something to which I don’t aspire. I have enough trouble not living up to my family nickname of “Chainsaw Barb” when I try to neatly slice a cuke. I know exactly how heartbroken you must have been over the slug damage. I am so grateful not to have them. But no garden is complete without its potential ravager(s), and I have deer and voles to fill that bill. Sometimes enough to make me want to throw in the towel. Almost. The slugs serve me right really, I have had so many years of one-upmanship over my neighbours who complained about slugs, that they were inevitably going to move in one day. I am a bit sad about my seedlings, but one row of purple lettuce is untouched! It’s amazing, they can’t climb in there fast enough, so I assume a happy death. You must knave long sight, the beer is called London Pride! I don’t have a garden or slugs, but it is a fascinating info. I love the way your garden looks now, Hilary. Good luck finding the right publisher. 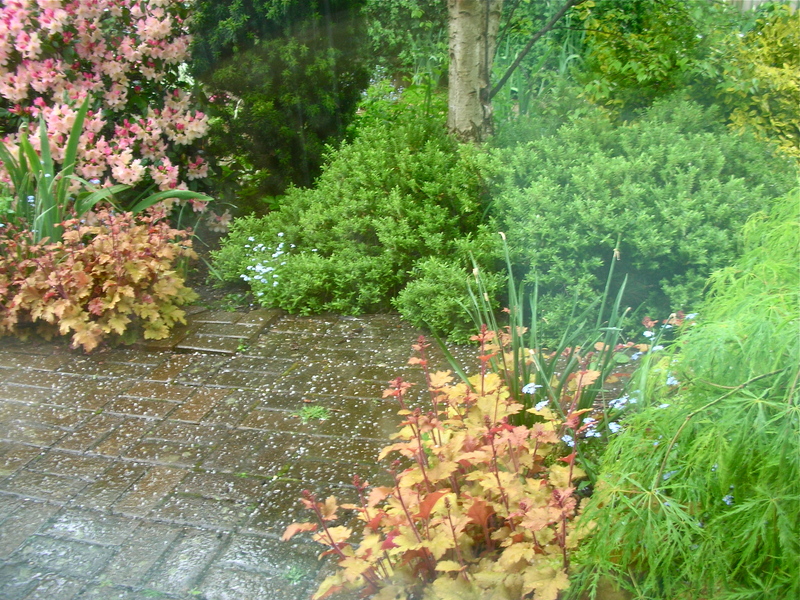 Thanks, one of the joys of posting photos of my garden is that at any one season I can point the camera at the best bits and just ignore the parts in need of attention. 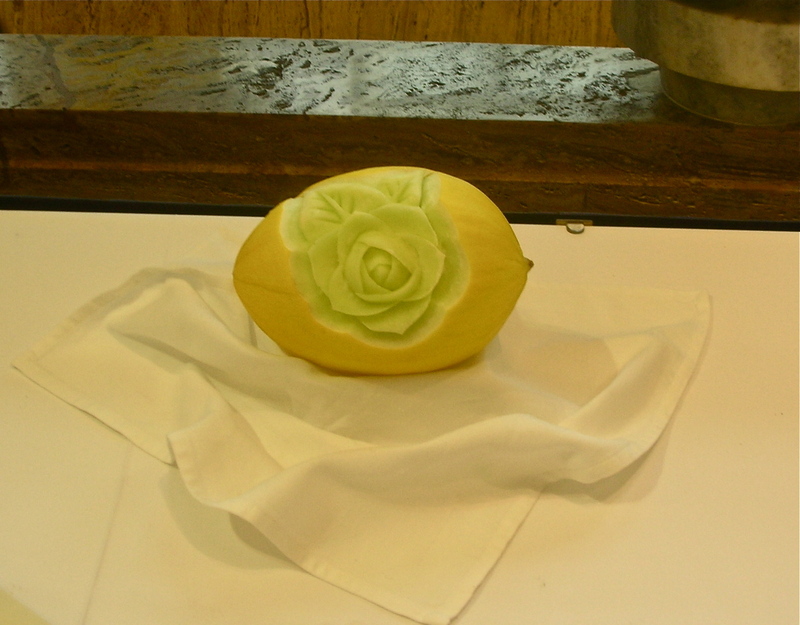 Wow gorgeous melon art and gorgeous flowers! Those cooks in Prague certainly gave it their all. Love the melon carvings. And hope to read more of your posts. Thanks to Curt Mekemson, I’ve found your blog. Thanks for visiting. Very happy to be linked to Curt, though I post on a somewhat smaller scale! An email from 2013?! Wow, that must be one packed inbox. Best of luck with the publisher. Hope it works out for you. Thanks for visiting my site. Much appreciated! I got hold of a print copy of one of his titles and the quality of the book and the typesetting was unimpressive. So I managed a polite no. Ah. I don’t blame you. Hilary, the carvings were spectacular indeed. I cannot imagine the time invested by someone to have carved out such masterpieces. Was the second one a lemon? It seems to be larger than a lemon, though. Unbelievably, beer does work well here in SoCal against snails and such. But to have a publisher clawing at your doorstep… How nice! Yes, I worried about the cook’s time on the melons (one Honeydew melon, one water melon). Thanks to internet advice, I have now caught many slugs with the beer. The publisher was not viable – not very high quality publications – but nice indeed to be asked.